Call or click here for a free on-site estimate! 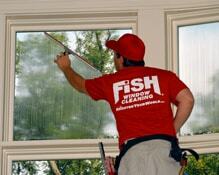 there are five Fish Window Cleaning locations ready to serve you! If your home or business is not within these highlighted territories, please call (877) 707-3474. We know you're busy and that's why we provide a wide range of services. We clean all types of windows, even the hard to reach ones of your home. We can also make your chandelier sparkle, remove all debris from your gutters, pressure washing your patios, decks, and more! Your home is important to us. That's why we wear clean shoe covers and use cloth pads under your windows to protect your flooring. We use environmentally-friendly cleaning products so you, your family, and your pets aren't subjected to harsh fumes. We even introduce our team to you before we begin cleaning so you know exactly who is making your home shine! "Their team can be trusted to come into my house without my having to 'put things away'. Their friendliness brightens my day." We're a business too so we understand the needs of businessowners. We also understand that the needs of businesses are all different so we tailor our programs to meet your schedule, budget, and needs. A member of our professional team would be happy to suggest a program that would work best for your office, restaurant, or any other commercial building. We are licensed, bonded, and insured to ensure your protection as well as the protection of our window cleaners. Our on-site, no-obligation estimates are always free and we are committed to your satisfaction! We offer hassle-free service. No contracts are ever required. Our professional team is trained and uniformed. All of our cleaning schedules are customizable. We care about our customers' happiness. We show up when we say we will.